2 pkg Shake-n-Bake pork seasoning in a ziploc. Tear the sausage into little bits. In a bowl, mix sausage, biscuit mix, and 6 oz. of cheese into a dough. Cut the stem and tip off a pepper. Cut the pepper in half to make two round pieces and remove the seeds. Stuff the pepper with cheese. Create a very flat patty of the biscuit/sausage mixture. Place a stuffed pepper piece on the patty and wrap the dough around the pepper, pinching the dough sealed, forming an egg shape. Drop the pepper in the ziploc and shake it to coat well. Repeat with all pepper pieces. Heat the dutch oven to 350 degrees for Baking. Place a layer of wrapped peppers in the dutch oven and Bake 30 minutes, until they are very brown all over. Be sure to cook the sausage well. 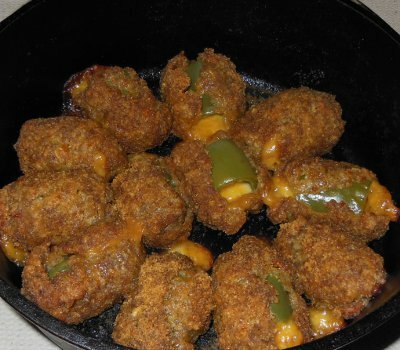 Let me know how you enjoyed your Armadillo Eggs! I made these this weekend. They were great. I only used two cups of Shredded cheese and only one packet of Shake and Bake. They barely fit in the 12" Dutch oven and I probably let them go longer than 30 minutes to be on the safe side. I made these in September with charcoal and they were the highlight of our camping trip. They were certainly very spicy - I might try half with regular sausage and half with the hot pork sausage next time. I can't wait to make these again. I cooked them in batches so they all could brown evenly. Delicious!